The Ivanpah solar thermal power plant started operating in the Mojave desert in California on Thursday. The $2.2 billion power-generating plant covers an area of 3,500 acres and has over 300,000 mirrors that reflect sunlight onto boilers located on top of three towers. According to BrightSource Energy, Inc., it is the largest solar thermal power plant in the world. The Ivanpah solar thermal power plant, known as the Ivanpah Solar Electric Generating System, is a joing venture between Google, NRG and BrightSource Energy. The project, which had a loan guarantee from the US Department of Energy for $1.6 billion, achieved commercial operation on the last day of 2013. A loan guarantee means that in event of a default the guarantor pledges to service the debt. Ivanpah accounts for nearly one third of all solar thermal power currently produced in the United States. It is the largest project of its kind globally. The electricity generated by Ivanpah’s Units 1 and 3 are being bought by Pacific Gas & Electric under two long-term agreements, while the energy produced at Unit 2 is being purchased by Southern California Edison under a similar contract. As is common in giant projects, during the construction period other technologies emerge. 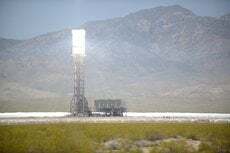 Experts doubt more plants like Ivanpah will be built, because there are now other solar technologies that are far cheaper than solar thermal. The disappearance of federal guarantees for renewable energy projects, as well as natural gas plants that are much cheaper to build also make it highly unlikely that we will see any new solar thermal power plant projects. Without government funds for these types of projects, which the Obama administration has not renewed, natural-gas fired plants costs approximately $1,000 per megawatt compared to $5,500 that Ivanpah cost. Traditional solar panels have dropped in price significantly since the start of the Ivanpah project in 2010, making solar thermal much comparatively much more expensive today. BrightSource Energy Inc. has not managed to secure permits for other solar thermal projects in California, partly because of fears that the extreme heat and energy around the plant could kill local birds, as well as some other environmental concerns.